The website(s) mentioned and the content is owned by Valerie Hudgins (“Company”, “we”, or “us”). The term “you” refers to the user or viewer of any or all of the following website(s): ZenDogWebServices.com, ZenDogWeb.com, ValerieHudgins.com, EasyAuthorwebsites.com, DashboardStatistics.com and/or GoingVeggie.com. (“website”). Information you provide to us directly: When you visit or use some parts of our websites and/or services we might ask you to provide Personal Data to us when you complete a contact form, respond to an email offer or to receive a newsletter, participate with us on social media forums, sign up on a membership site, enroll in one of our webhosting service products, sign up for our Continuous Care updating and maintenance, add on additional security with our Security Package/Insurance or when you submit billing information to us for website work-for-hire, etc. By doing so you are giving this information to us voluntarily, and by providing us with this information you are giving us consent to use, collect and process this Personal Data. If at any time you wish to opt-out or request us to delete your personal data you can contact us at Info@ZenDogWebServices. If you choose not to provide us with certain Personal Data, you may not be able to participate in certain services, products or other aspects of our website or content. Cookies: Some of this information is collected using standard cookies and similar tracking technologies. We do not set any personally identifiable information in cookies, nor do we employ any data-capture mechanisms on our website other than cookies. You can choose to disable cookies through your own web browser’s settings. Please note disabling this function may cause some of the features on this website not to work as well as intended. Primarily, we use your Personal Data to operate our website, and provide you with any services you’ve requested, and to manage our relationship with you. To communicate with you: We may provide you with information you’ve requested from us or information we are required to send to you. We may communicate with you about changes to our websites and services, security updates, or for assistance with using our website and services. We may send you marketing materials we think you may be legitimately interested in or ask you for feedback or to take part in any research we are conducting via a vetted third party. To market to you: In addition to marketing communications, we may also use your Personal Data to display targeted advertising to you online – through our own website, through third party websites or through social media platforms. For those in the European Union (EU), this means that your data may be transferred outside of the EU. Where your Personal Data is transferred outside the EU, it will only be transferred to countries that have been identified as providing adequate protection for EU data or to a third party where we have approved transfer mechanisms in place to protect your Personal Data. If you have been with Zen Dog Web Services for any length of time, you know that security is a priority; security for your website and your Personal Data. We are committed to protecting your Personal Data and will take all commercially reasonable steps to protect the Personal Data you provide to us from misuse, disclosure or unauthorized access. That said, no one can 100% guarantee data safety, so we cannot guarantee that your Personal Data will always be secure due to technology or security breaches. If we become aware of a high-risk data breach, we will notify you (and the appropriate authority) within 72 hours. To use certain features of our website(s) or their content, you may need a username and password. You are responsible for maintaining the confidentiality of the username and password, and you are responsible for all activities, whether by you or by others, that occur under your username or password and within your account. We cannot and will not be liable for any loss or damage arising from your failure to protect your username, password or account information. If you share your username or password with others, they may be able to obtain access to your Personal Data at your own risk. You agree to notify us immediately of any unauthorized or improper use of your username or password or any other breach of security. To help protect against unauthorized or improper use, make sure that you log out at the end of each session that requires your username and password. We may link to other websites frpm our website(s). We have no responsibility or liability for the content and activities of any other individual, company or entity whose website or materials may be linked to our website(s) or their content, and thus we cannot be held liable for the privacy of the information on their website or that you voluntarily share with their website. Please review their privacy policies for guidelines as to how they respectively store, use and protect the privacy of your Personal Data. We do not collect any information from anyone under 18 years of age in compliance with COPPA (Children’s Online Privacy Protection Act) and the GDPR (General Data Protection Regulation of the EU). Our website(s) is/are not intended for children under 18 years of age. No one under age 18 may provide any information to or on the website. We do not knowingly collect personal information from children under 18. If you are under 18, do not use or provide any information on this website or on or through any of its features/register on the website, make any purchases through the website, use any of the interactive or public comment features of this website or provide any information about yourself to us, including your name, address, telephone number, email address, or any screen name or user name you may use. If we learn we have collected or received personal information from a child under 18 without verification of parental consent, we will delete that information. If you believe we might have any information from or about a child under 18, please contact us at Info@ZenDogWebServices.com. You have the right to ask us not to send you marketing emails at any time by sending your request to Info@ZenDogWebServices.com. You can also just follow the unsubscribe instructions contained in the marketing communication. You can exercise these rights at any time by sending an email to us at Info@ZenDogWebServices.com which we will respond to within 30 days. If you wish to make a complaint you can email us at Info@ZenDogWebServices.com. We will review and investigate your complaint and get back to you. 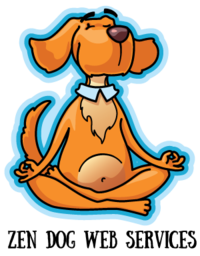 Zen Dog Web Services, Inc.